This is such a sweet Christmas card! Love the mini tags for the word Happy! Good luck with the craft show! Too cute. I like your adorable character. Beautiful layout. Good work ! Beautiful card. I can see why you like the reindeer so much, it's very cute! That guy is absolutely charming. I love how you have added the "Happy" and the snowflake is a lovely touch! Gorgeous card Sylvie! I love the way the little fella stands out from the white background, fab card! Shame you have had rain! Hope it clears up soon. Hugs! He is one very cute little reindeer that's for sure. You have been making some very lovely Christmas cards .. .. has your craft fayre been and gone?!? If so I hope you did well again. 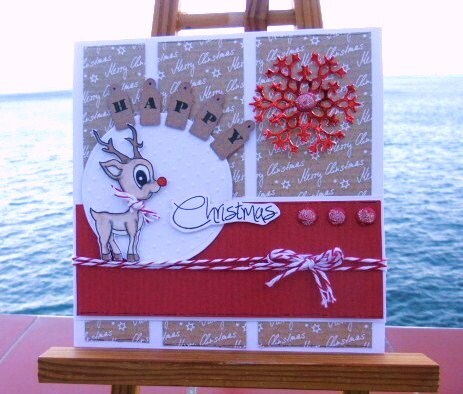 A gorgeous Christmas card and I love the cute Rudolph image you have used. Thanks for joining us this week at Charisma Cardz. Super fun card Sylvie. Hope you had a successful day at the fair. This is a fab card Sylvie, I love the way you have arranged the sentiment. Exactly how can I download and install a complimentary model of hplaserjet 1020?